GPU performance of the Note9 shouldn’t be much of a surprise by now as we’ve covered the Snapdragon 845 and Exynos 9810 extensively in this regard. Yet, the Note9 does differ significantly in this regard because Samsung claims to have included a new massive heat-pipe and heat spreader, theoretically much improving the thermal dissipation from the SoC to the body of the phone. I’m actually starting off this article with a test of the device’s thermals, because I found some quite weird results here that I feel are quite inexplicable in their behaviour, and something that I found to happen in quite a lot of the Snapdragon 845 devices in 2018. I’m using the on-screen Manhattan 3.1 test in 1440p on-screen mode in a continuous loop for an hour. Besides both Note9’s, I’m also including the S9+ in order to see just how much of an effect the Note9’s new heat-pipe is able to help with performance and thermals. Performance wise, the results are very surprising. The Snapdragon Note9 for the better part of the first 20 minutes seems to actually perform slightly worse than the S9+. Both phones look to be throttling at virtually the same identical point, which I also found to be quite weird. It’s only much later in the test, after the 35 minute mark, where the Note9 starts to fluctuate more in terms of performance, recovering to a higher GPU frequency for a few minutes before falling back to the minimum performance and continuing so forth ad infinitum. The Exynos Note9 as expected, performs worse than the Snapdragon unit, but this shouldn’t be much of a surprise. Actually examining the temperature reported by the phones we again see some very weird behaviour. The temperature here is as reported by an internal sensor on the phones. I don’t usually like showcasing these results because the sensors will vary between devices and vendors. This case is an exception because the sensor between the two Note9’s should be identical (battery PMIC IC), as well as very comparable to the S9+. The actual maximum skin temperature as measured by an IR thermometer are higher than the values shown here. The one thing that again feels utterly unexplainable to me is the fact that there’s a notable change in throttling behaviour after the 20 minute mark, all seemingly unrelated to the actual temperature of the phones. The Snapdragon Note9 does report much better maximum temperatures over the S9+. The Exynos Note9 here also achieves even better temperatures, and this pretty much falls in line with the fact that the Exynos 9810’s peak power consumption in GPU workloads is actually lower than the Snapdragon 845’s. Now this 20 minute mark in the temperatures is something that I’ve encountered more often this year across devices, yet I haven’t actually found any good evidence as to explain it. The Snapdragon Note9 showcases that it has intermediate throttling levels later on in its runtime, what puzzles me is as to why the device doesn’t set this medium frequency level earlier in the runtime when reaching the same throttling temperature? The Snapdragon 845’s behaviour here is very weird: In our initial review of the Galaxy S9+ I mentioned that the phone entered an overheating state killing the benchmark, reaching high skin temperatures of up to 58°C. In subsequent firmware updates over the summer I wasn't able to reproduce this anymore. I actually found the same issue in the Xiaomi Mi MIX2S which was also quickly resolved with a firmware update. This lets me believe that Qualcomm actually has some sort of time-, rather than a temperature-based boost/throttle mode in the drivers of the chip. I’m very perplexed by this as I can’t discern if this is a legitimate mechanism or not. The thermal considerations being mentioned, we continue on with our standard set of benchmarks. 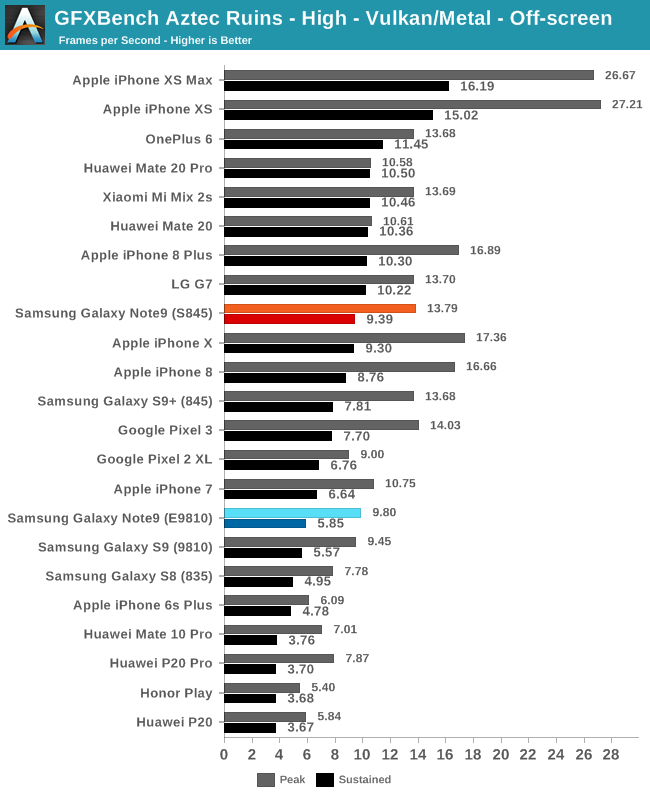 In the 3DMark Physics test, the Note 9 fares extremely well in terms of the sustained performance scores. 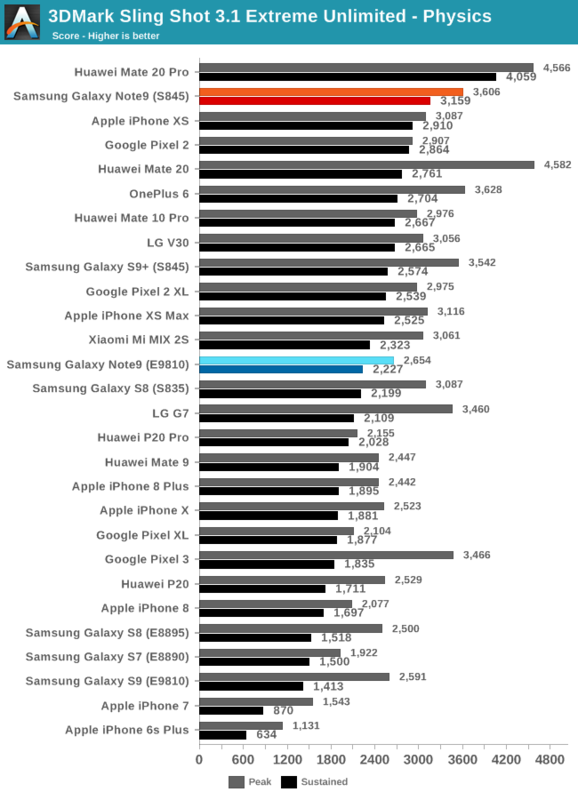 Here we see quite a jump over the results of the S9+, and at the same time this makes the Snapdragon Note9 the best S845 device in this particular benchmark. 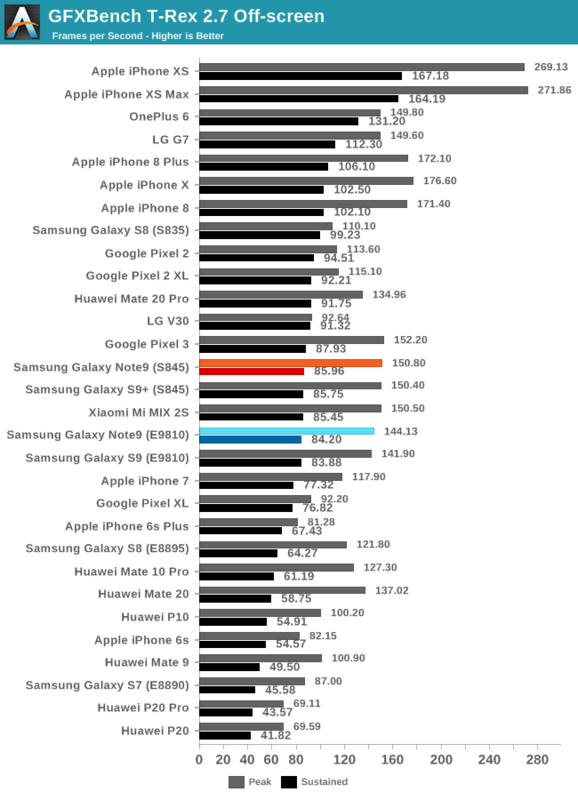 The Exynos Note9 also showcases much improved sustained performance scores much higher than that of the S9. The 3DMark graphics results have me a bit perplexed. The Snapdragon Note9’s sustained performance scores are good- really good- too good. We showcased that the devices do throttle after certain amount of time, yet in 3DMark I wasn’t able to actually enter this sustained state in any way on the Note9’s, even after prolonged heating. I don’t have a way to loop 3DMark in the same way I loop GFXBench, and I have to wonder if this plays a role here. The Snapdragon Note9 was allowed to get really hot here, reaching 48°C+ skin temperatures near the SoC. I’m using obfuscated applications IDs to avoid benchmark detection – still I have some reservations about these scores on whether they’re results of genuine thermal mechanisms or something else. 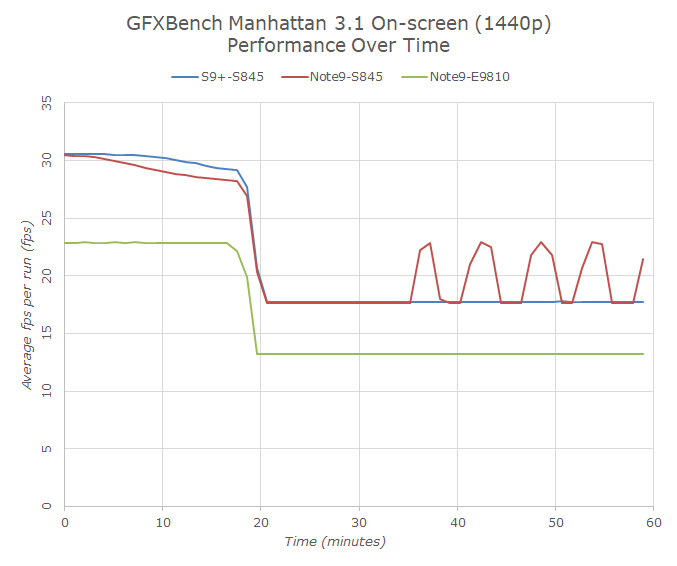 Moving on to GFXBench, we’re seeing some more reasonable sustained performance results in the “High” benchmark mode. 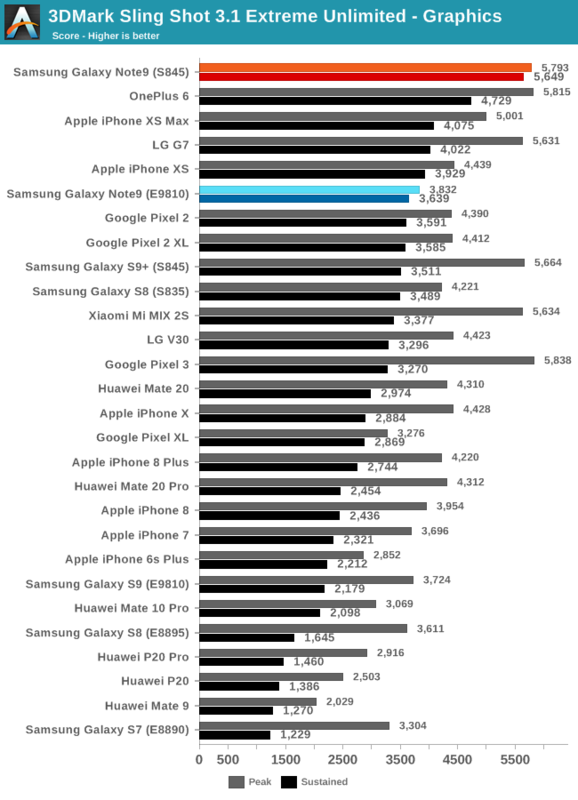 Again I have a hard time explaining why the Normal mode scores that much better for the Snapdragon Note9, here it’s maybe a side-effect of the higher ALU utilisation in the high mode which also causes higher power consumption in the Adreno 630. In Manhattan, we see a similar result as in the Normal Aztec run, with the Snapdragon 845 Note9 maintaining excellent sustained perf. Switching over to T-Rex, things again are more in line with previous Snapdragon 845 results. The Exynos Note9 also is behaving very similar to the S9. I’ve ran these tests several times now and again noticed there some unexplained variability in the results that aren’t explained by the actual temperature of the phones. Under thermal stress, the Snapdragon Note9 sometimes performs excellently even at high sustained temperatures of the device, and sometimes it logically throttles as you would expect it to. It’s something I’ll have to dig in a bit more into. In any case, the verdict here is that the Snapdragon Note9 performs excellently in terms of sustained performance. 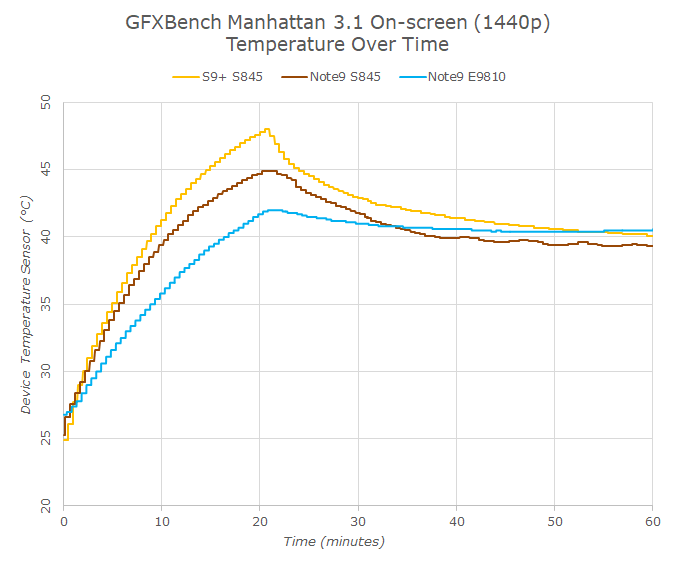 The Exynos Note9’s sustained performance in GFXBench was a lot more alike the S9 – both devices allowing for much lesser peak temperatures than the Snapdragon counterparts, but again both also showcasing significantly worse performance due to the weaker GPUs.